Stretching to a length of 53.4 kilometers (33miles), The Black River is Jamaica’s biggest navigable river, and is one of the country’s most notable eco-tourism destination. The river is situated on the south coast of the nation, in the Parish of St. Elizabeth. There is a town also named Black River that resides on its mouth. Black River is composed primarily of wetland vegetation that features various species of palms, mangrove and freshwater swamp forest. Its name was derived from the huge deposits of peat under water that is responsible for the river’s dark color. The best way to experience this unique attraction is to go for a river safari tour. 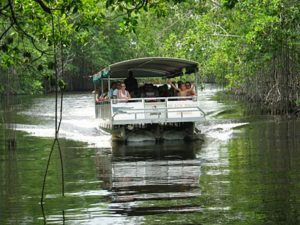 By doing so, you will discover Black River’s true beauty and ecological traits, as well as learn about the history of the region. The Black River Safari tour also exposes you to the different wildlife that calls the river home. Examples of these wildlife are the more than 100 species of plumed birds like snowy egrets and herons. Black River also houses one of the countryís largest crocodile population. Some of these crocodile species are considered endangered. There are many companies that offer guided boat tours through the river, so, you have plenty of chances to choose one that truly caters to your needs and preferences. Most of the basic tours bring you to the lower morass of the river, well-complemented by a running commentary on the history and ecology of the river area. Black River has become a popular tourist destination not only for the river safari but also as it is close to other wonderful natural attractions, like the YS Falls, Treasure Beach Resort and the Appleton Rum Factory. Standing at 120 feet or 36 meters, YS Falls is known to be the largest set of cascades in Jamaica, but at the same time, it is also the least commercialized. The falls unspoiled state makes it a fascinating place to visit. Grab the chance to relax in its clear natural pool, while allowing water from natural springs to splash in! Other activities to enjoy in this area include river tubing, picnics and canopy rides. Take note the falls is actually located on a privately owned estate that has belonged to the same family for more than a century. The laidback town of Black River is the main access point to the river, and is also an attraction in itself. Staying here for a couple of days can be a wondrous cultural experience. Although it is considered a big city in the parish, it most definitely exudes a more small town feel. After enjoying the river safari cruise, take the time to explore Black River town and its many important historical structures, most of which exhibit the grandiose Georgian architecture, which flourished in the 19th century. Some of these must-see buildings include the Courthouse and the Invercauld Great House. 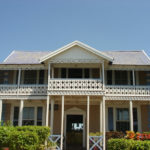 Another historic structure that locals are especially proud of is the Waterloo Guest House, which lays claim to being the first house to have electricity in the country during the year 1893.